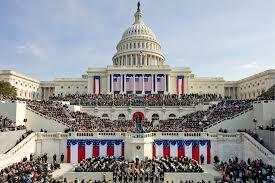 There is a lot I want to say about the inaugural festivities, which I've been watching all day, but I’m sort of busy. We’re leaving for Vegas Wednesday for our son’s wedding. My niece and her husband are coming to stay with the dachshunds. They (my niece and her husband, not the dachshunds) are super-neat and clean, so I’ve been vacuuming, dusting, scrubbing, etc. all day, and I still have a bathroom and the living room to do before they arrive in the morning. Which means I don’t really have time to do justice to this post. But I’ll give it the old college try. New York Sen. Chuck Schumer, the master of ceremonies, couldn’t resist getting a dig in at Romney as he introduced the first musical act, “the Tabernacle Choir – the Brooklyn Tabernacle Choir” (as opposed to the Mormon Tabernacle Choir which Romney would have likely invited). Schumer is an arrogant prick but I’m not holding that against the Brooklyn Tabernacle Choir whose rendition of the Battle Hymn of the Republic made the hairs on my neck stand straight up. Once I scrub the guest room toilet I have to check iTunes to see if I can download it. As a friend pointed out on Facebook, James Taylor, who sang America The Beautiful, looks old. His “Sweet Baby James” album was huge the fall of my sophomore year of college. My roommate played it constantly. I got sick of it. Fire & Rain. Steamroller. Blossom. Yadda Yadda. Let’s see, that was … 42 and a half years ago. Yep, he’s old. There was, as there always is at an inauguration, a poet who read something he had composed for the occasion. I took the recycling out to the curb near what I assumed was the end of his poem, had a conversation with a neighbor, swept out the garage, and he was still prattling on about colorful fruit in a marketplace or something like that when I returned. I suggest that, in the future, the inaugural committee dispense with the epic poem and sell $5 million commercials like the networks do during the Super Bowl and kick the money back to the Treasury. The president’s youngest daughter kept looking down as her father was speaking. Maybe she was texting. Obama's speech, which I listened to as I dusted, was eloquent. But tonight I can't remember anything he said. Something about "We the People." I'm not sure but I don't think his speechwriters came up with that term. The Internet’s abuzz with a video of Michelle Obama rolling her eyes at John Boehner as they were seated next to each other at the post inaugural luncheon in the Capitol and he tried to engage her in conversation. I’m no Boehner fan but, having watched it, I think he was asking her to get her elbows off the table. Gotta run to the store for some Fantastic. More later. My favorite movie is Sunset Boulevard, starring Gloria Swanson and William Holden. It speaks to me. It speaks for me, and for every writer. Holden is a down-on-his-luck screenwriter who, while being chased by men trying to repossess his car, ducks into the estate of an aging silent film star (Swanson) who spends her days in a bitter funk, stewing that her career vaporized decades ago with the advent of talkies. While she had been perfectly able to communicate visually, the words she was expected to deliver once talkies came along simply weren’t her thing. Swanson convinces Holden to collaborate on a script that will be her vehicle for a triumphant comeback. He does. The studio doesn’t buy it. She shoots him dead. The visual artist lives to see another day. The wordsmith winds up face down in a swimming pool. Sad but, as every writer knows, true. I have always known that, given a choice between reading my words and looking at the photos or graphics that accompany them, most people will choose the visuals. This blog is an example. Google sends me statistics for every post, showing how many people clicked it on. The posts with the most provocative pictures get the most views. I have no way of knowing whether anyone actually reads the words underneath. Some of my best posts have had the fewest views because the visuals weren’t as entertaining. I ran an ad agency for 30 years. Clients cared, for the most part, only about the pictures in any print ad the agency created. Words, other than those used in the headline, weren’t important. To prove my theory, I once wrote an ad for a car rental company and interspersed dirty words throughout the body copy. The client didn’t catch them until the final round of approvals. (And if she hadn’t, I would have removed them before it was sent out for publication.) Take a look at print ads these days (assuming, of course, you still subscribe to a newspaper or magazine). There are no words in many of them – just a picture and logo. The Internet has evolved in a medium that’s primarily visual. Given a choice of pictures or words, most people will go for the pics and, if they read the words that go along with them, will only read the first sentence to get the gist. Because anyone and his dog (including yours truly and his dogs) can post anything on the Internet, many people are unable to discriminate between good writing and bad writing. So they have simply stopped reading. A few months ago I visited the Newseum in Washington, D.C., a museum dedicated to news reporting. There is a room in which dozens of Pulitzer Prize-winning photos are displayed. They are powerful and emotional pieces of journalism but, unless one reads the captions underneath explaining the circumstances in which they were taken, they make very little sense. Most people, I noted, were skipping from photo to photo and weren’t taking the time to read about what they were seeing. People these days seem unwilling or, more disturbingly, truly unable to process words. A few years ago on the TV show, The Amazing Race, a contestant, a recent college grad from an upscale Chicago ‘burb where, presumably, the schools are good, had to listen over the phone to a Confucian proverb approximately 15 seconds long, run a few hundred feet to a judge, and recite it perfectly in order to advance. She must have listened to that message 30 times before she got it right. Perhaps she has an auditory processing problem. More likely, she wasn’t accustomed to having to think about what words mean. Older contestants, I couldn't help but note, had no problem memorizing the proverb. My mother, who will be 100 in April, can still recite, verbatim, poems by Poe, Longfellow and Whitman she was required to memorize in her one-room school more than 90 years ago. Of course, back then there was very little competing with words for students’ attention. They didn’t have access to the Internet, video games, TV, smart phones and the like. I would have to guess that most schoolchildren today have a hard time memorizing the Pledge of Allegiance. Take Twitter. Please. Twitter limits users to a maximum of 140 characters. Millions of users worldwide are proof that words, in today’s society, aren’t important. It is difficult to express a coherent thought in 140 characters without butchering the language. When I joined Facebook four years ago, I enjoyed reading posts from friends and acquaintances. But Facebook has, since then, become a visual medium -- words are few and far between. 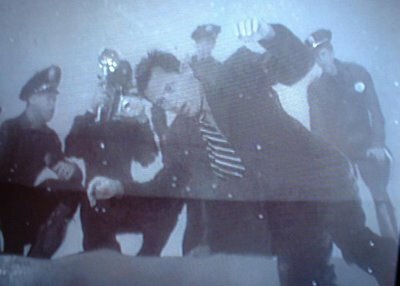 Most people, if they post at all these days, post a picture or video clip with no explanation of why they are doing so. I have 176 Facebook friends. A few years ago dozens of them would post news about themselves on any given day. A total of 17 posted to Facebook yesterday. Of those posts, 10 were photos or videos -- no words. A few days ago a friend posted tragic news about a family member. Lots of friends wrote underneath that they were praying, thinking about the family or were otherwise sorry. Others merely clicked the "Like" button. Perhaps they couldn't express in words what they were feeling – I have no doubt they, like those who wrote something, were distressed at my friend's news --but “like” wasn’t an appropriate response. This is my ninety-ninth post to tomdryden.com. If you have read any of my posts and, especially if you’ve read this one to the end, I thank you. If you’ve only looked at the pictures, I would say thank you if I were paid by clicks, but I’m not, so I won’t. I’m not paid anything. I write it because, for some reason, I have always loved words, an art form that, like William Holden’s character in Sunset Boulevard, is dying a painful death. I suggest you scroll down to the blog entry for Jan. 7 and read that first. “Cain’t do that,” she replied, pointing to the "No Refunds" sign taped to the wall. “Look,” I said gently but firmly, placing the key on the counter. “I’m not going to stay in a place that’s ever had one bedbug, much less an infestation." “I done told you,” she replied, indicating the sign with a shrug. I turned from the counter, walked across the lobby, through the front door and got into the car. “What took you so long?” my wife asked. “Yes, let’s,” I replied wearily, pressing the car’s “Start” button. I drive one of those cars that doesn’t need a key to start. It’s from Japan. Leave it to the Japanese to come up with a technology people neither need or want. I’d much prefer a good old-fashioned key. I worry, for instance, what might happen if the battery on the fob I have to carry in my pocket died. If I was outside the car and the door was locked, how could I get in? Would I have to call roadside assistance? I might not be able to because, with my luck, my cell phone would be locked inside. I don’t even know if you can buy a car with a key these days. Probably not. We were halfway to Savannah when I remembered and smacked myself upside the head, like the guy in the commercial the moment he realizes he could have had a V-8. I don’t have a wedding ring. I lost it the week after we got married. (Voiceover): We went around the country asking women to speak frankly about something nobody wants to talk about. (Woman # 1, firmly) It's time to get real about what happens in the bathroom. (Woman # 2): Stop all the cutesy stuff. (Woman # 4): It's time to talk about clean. (Woman # 5): Feeling clean is so important. (Voiceover): Quilted Northern Soft & Strong is stronger than the leading ripple brand to help protect against breakthrough. (Woman # 6): For myself, for my family, it keeps us clean. (Woman # 7): I use Quilted Northern. (Voiceover): Quilted Northern Soft & Strong. Protection for a confident clean. 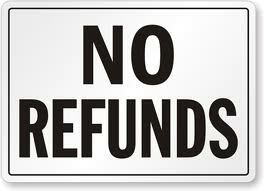 Or your money back. The commercial is so profoundly disturbing in so many ways that I hardly know where to begin. So let me address my concerns, in order. We went around the country asking women … : Why only women? Don’t men use TP, too? Of course we do, unless we’re out in the wild doing manly things like hunting and camping in which case we grab whatever’s handy. As a Boy Scout, I once used a poison oak leaf. But that’s a topic for another day. My point is, limiting participation to women is blatantly sexist. I urge all men to boycott Quilted Northern. It’s time to get real about what happens in the bathroom: If so, why not show someone sitting on the toilet reading People magazine instead of women standing around on a giant map? 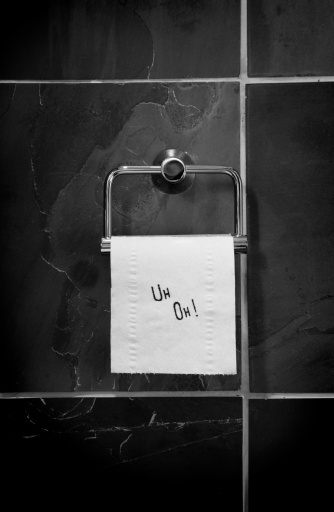 It’s time to talk about what you really want from your toilet paper: It’s time to talk about the fact that President Obama, who promised he wouldn’t raise taxes on the middle class, just raised the average family’s tax bill $1,600 a year. It’s time to talk about the fact that 72 percent of high school students have no clue which countries America fought during WW II. It’s time to talk about many things. What you want from your TP isn’t one of them. Feeling clean is so important: If you feel that strongly, join the Peace Corps and volunteer for Haiti, Somalia or India where children have to bathe in sewage rather than interrupt me while I’m eating a Little Debbie Chocolate Snack Pie to talk about the cleanliness of your … you know. Help(s) protect against breakthrough when wet: If Quilted Northern only prevents breakthrough better than the leading ripple brand when it’s wet, is the manufacturer saying we should dunk it in water before we wipe with it? Where are we supposed to get that water? If we're sitting on the toilet, we can’t very well get up and run to the sink to wet the tissue. Are we supposed to bring a pan of water to the toilet with us for this purpose? The only practical way I can imagine wetting the Northern to make it stronger is to dunk it in the toilet bowl, which is hardly sanitary. For myself, for my family, it keeps us clean: How does she know for sure it keeps her family clean? Does she ask them? “Honey, did your toilet paper get every scintilla of that gunk out of your _ _ _?" Does she insist on doing a visual inspection every time family members emerge from the bathroom? Does she judge by the skid marks (or lack thereof) on their underwear when sorting laundry? However she determines it, we don't want to know. Protection for a confident clean. Or your money back: If I find that Quilted Northern doesn’t make me feel confidently clean, how do I go about getting my money back? Do I take unused rolls back to the store and tell the customer service people, “I don’t feel confidently clean?” If so, do they require proof? Do I contact the manufacturer? Don't leave us guessing. Tell us. Better yet, come up with a new commercial. I understand Charmin's Mr. Whipple is retired but I bet he could be coaxed out if Quilted Northern offered him a shitload of money. The motor lodge. A hastily-written but true story. I couldn't make this story up. It actually happened, exactly as I tell it, during our drive from Connecticut to Florida this past weekend. I could, I'll admit, have spent more time writing it. But I'm tired. You would be, too, if you had driven 1343 miles in two days. It was nearly 11 when the heavens opened up and the downpour began. We had driven almost 700 miles. We weren’t going to make Savannah tonight. “Let’s get a room,” my wife suggested. We left the interstate at the next exit, turned left at the top of the ramp, crossed the overpass and turned into the driveway toward the familiar Holiday Inn® sign. “No vacancy,” said a hand-lettered sign taped to the front door. We crossed back over the overpass and were preparing to turn south onto the interstate when we spied the neon sign a block or so down the road. “Is that a hotel?” my wife asked hopefully. “Let’s find out,” I said, turning off the car's directional signal, which I had flicked on out of habit, even though nobody was following me. It was a lesson I had learned in Driver’s Ed, the most valuable class I took during my high school years. A pity schools don’t offer it any more. 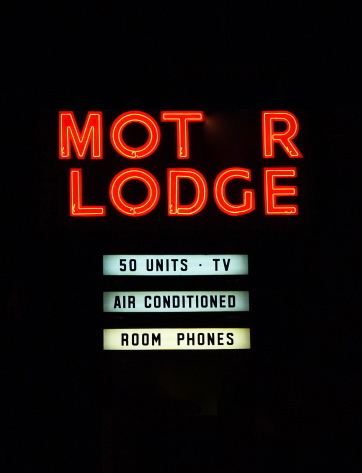 “The (Name Deleted In Case The Owner is Litigious) Motor Lodge,” proclaimed the sign alongside the sprawling one-story stone building with a Spanish tile roof. The edifice resembled a motel one would expect to find along Route 66 as it wends its way through New Mexico and Arizona, but it was distinctly incongruous in the Low Country. Stubby palm trees lined either side of the driveway. I turned in, and the car rolled to a stop under the canopy in front of the lobby. The moment I stepped into the drab, barely lit room with the mismatched veneer furniture and faded wing back chairs positioned on either side of the fireplace, every instinct I possessed told me I should turn and run, not walk, back to the car. Then I saw the desk clerk, an ancient woman seated behind the desk. She smiled, revealing a single tooth dangling from the left side of her upper gum. That was it. One tooth, covered with yellow waxy build-up. Horrified yet fascinated at the same time, I continued toward her like a moth drawn to a flame. “Yes,” I replied, trying not to stare, as if encountering a snaggle-toothed hag was something I was accustomed to doing every day. As I approached the desk I realized she wasn’t sitting at all. She was standing. I was in the presence of one of the little people. Not the little people hotel queen Leona Helmsley once described derisively – the ones who are stupid enough to pay taxes. A little person. Four feet, tops, wearing a grey, faded, child-sized South Carolina Gamecocks sweatshirt. A bolt of lightening visible through the dirt-streaked picture window lit the sky outside followed, a split second later, by the crash of thunder. I gave her my credit card. A moment later, having run it through the machine, she reached up and, standing on tippy toes, thrust the receipt across the counter into my waiting right hand, along with the key to room 182. "How do you know I'm traveling with my wife?" I asked, suddenly suspicious.